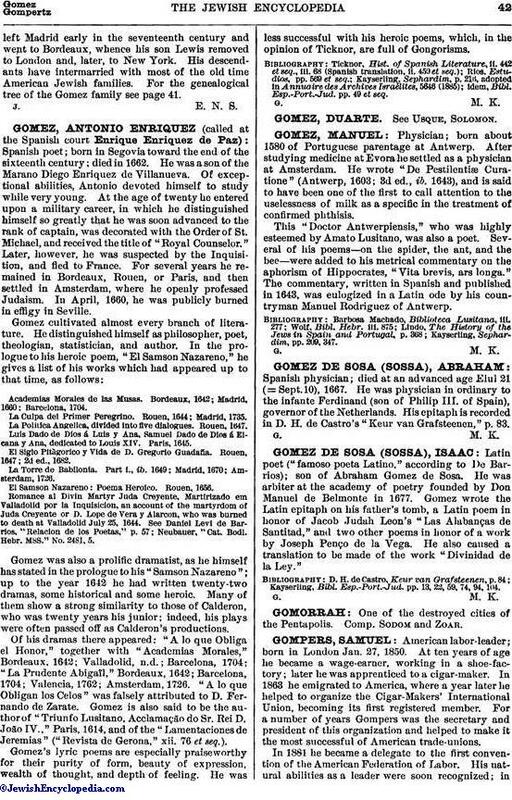 Spanish poet; born in Segovia toward the end of the sixteenth century; died in 1662. He was a son of the Marano Diego Enriquez de Villanueva. Of exceptional abilities, Antonio devoted himself to study while very young. At the age of twenty he entered upon a military career, in which he distinguished himself so greatly that he was soon advanced to the rank of captain, was decorated with the Order of St. Michael, and received the title of "Royal Counselor." Later, however, he was suspected by the Inquisition, and fled to France. For several years he remained in Bordeaux, Rouen, or Paris, and then settled in Amsterdam, where he openly professed Judaism. In April, 1660, he was publicly burned in effigy in Seville. Academias Morales de las Musas. Bordeaux, 1642; Madrid, 1660; Barcelona, 1704. La Culpa del Primer Peregrino. Rouen, 1614; Madrid, 1735. La Politica Angelica, divided into five dialogues. Rouen, 1647. Luis Dado de Dios á Luis y Ana, Samuel Dado de Dios á Elcana y Ana, dedicated to Louis XIV. Paris, 1615. El Siglo Pitágorico y Vida de D. Gregorio Guadafia. Rouen, 1647; 2d ed., 1682. La Torre de Babilonia. Part i., ib. 1649; Madrid, 1670; Amsterdam, 1726. El Samson Nazareno: Poema Heroico. Rouen, 1656. Romane al Divin Martyr Juda Creyente, Martirizado em Valladolid por la Inquisicion, an account of the martyrdom of Juda Creyente or D. Lope de Vera y Alarcon, who was burned to death at Valladolid July 25, 1644. See Daniel Levi de Barrios, "Relacion de los Poetas," p. 57; Neubauer, "Cat. Bodl. Hebr. MSS." No. 2481, 5. Gomez was also a prolific dramatist, as he himself has stated in the prologue to his "Samson Nazareno"; up to the year 1642 he had written twenty-two dramas, some historical and some heroic. Many of them show a strong similarity to those of Calderon, who was twenty years his junior; indeed, his plays were often passed off as Calderon's productions. Of his dramas there appeared: "A lo que Obliga el Honor," together with "Academias Morales," Bordeaux, 1642; Valladolid, n.d.; Barcelona, 1704; "La Prudente Abigail," Bordeaux, 1642; Barcelona, 1704; Valencia, 1762; Amsterdam, 1726. "A lo que Obligan los Celos" was falsely attributed to D. Fernando do Zarate. Gomez is also said to be the author of "Triunfo Lusitano, Acclamação do Sr. Rei D. João IV.," Paris, 1614, and of the "Lamentaciones de Jeremias" ("Revista de Gerona," xii. 76 et seq.). Gomez's lyric poems are especially praiseworthy for their purity of form, beauty of expression, wealth of thought, and depth of feeling. He was less successful with his heroic poems, which, in the opinion of Ticknor, are full of Gongorisms. idem, Bibl. Esp.-Port.-Jud. pp. 49 et seq.